Some readers might recall my occasional references to what remains my own on again, off again love affair with the game of golf. It is an endeavor introduced to me by a feisty, thick-knuckled grandfather who took up the game himself as a way of partially quenching his always-present need to compete. Shortly after that introduction to golf, I began to learn of the game’s most important modern-era ambassador and arguably, its single-greatest hero, Arnold Palmer. Arnie is now 86 years old. We share a birthday, he and I, separated by several decades, and I regularly play/curse/cajole my own golf game on one of the many courses he designed over his lifetime. He played that course too years ago when it first opened. The clubhouse keeps the clubs he used on that day behind a glass case as you enter the restaurant. Over the years I’ve stood staring at those clubs, marveling at their simple, timeless beauty, and wondering if a whisper of Mr. Palmer remains on the tightly wound, age-cracked leather grips. Yeah, I’m a fan of Arnold Palmer and have been since I was a boy and first saw footage of his slashing swing, his broad-shouldered, uniquely humble yet defiant walk as he navigated around a golf course from one tee, to fairway, to green and then on to the next. Palmer was Elvis in golf shoes, and I was fascinated by him. 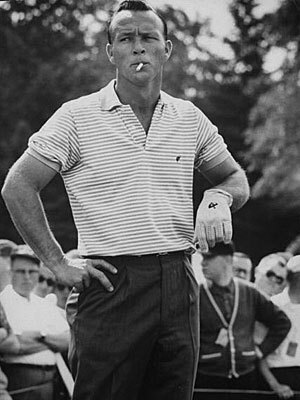 He made golf badass, and that’s no easy task. Arnie was older by the time I was able to regularly watch him play live on television as a member of the PGA Seniors Tour. (now called the Champions Tour) I particularly enjoyed seeing him and the other legends of golf competing in the Skins Game and later, the Senior Skins Game. In fact, one of the first golf moments I had with my own son was watching Arnie battle Jack, Gary, and Lee during a Senior Skins Game tournament. We were both cheering for a by then, much older Arnold Palmer. I read books about Palmer, books by Palmer, watched hours and hours of the Golf Channel, (started in part by Palmer) magazine articles, etc. I studied his swing, his grip, his historic wins and in many ways, his more historic losses. Born poor during the Great Depression, Arnold Palmer embodied the second half of the American 20th Century: confident but not cocky, brash but not overly bold, determined but also dignified, and always strong both physically and of character. He didn’t just play golf courses, he willed himself around them. His was a home-brewed swing that, at least in appearance, was familiar to millions of golfers whose own swings bore little resemblance to those of the perfect-tempo maestros who dominate the PGA Tour. And it was with that iconic swing that Arnie lived a life that included American presidents as friends but never for one second, forgot his own common-man roots. By the 1970’s, Arnie’s time on the PGA tour had turned into a somewhat symbolic affair, though he would bristle then at such a suggestion. He never relinquished his own competitive spirit, never gave up hope that with the right equipment and the right conditions, he couldn’t at any given time defeat the newest crop of young guns in the game he had devoted the entirety of his adult life to. It has been said that it was Palmer who gave the Senior Tour its longer term viability, and that is likely not far from the truth. Like he did at the outset of his PGA career, Arnie racked up a collection of Senior Tour victories while being followed yet again, by the largest and most adoring galleries in all of golf, galleries which didn’t really diminish even as his time on the Senior/Champions Tour held less and less chance of tournament victory. Palmer loved the game, loved the people, and so he golfed on and built a business empire in the process that included hospitals devoted to the needs of women and children, charities that gave millions of dollars to groups and individuals in need, and a lasting legacy of being the game of golf’s single greatest and most enduring ambassador. There was his own bout with prostate cancer, followed by the death of his beloved wife Winnie in 1999, that appeared to take an uncompromising toll on Palmer’s physical abilities, but in a way, only seemed to enhance his already considerable personality. He was all too human, and became more and more comfortable sharing that side of himself and the world loved him all the more for it. It’s 2016, and Arnold Palmer is an old man fighting a physical war of greatly diminished returns that is far removed from the swashbuckling images of decades ago. I hope he has one more miraculous rally left in him, and a long eighteen yet left to play, but if not, I want to thank him for simply being Mr. Palmer. A great American. A great man. A great role model.